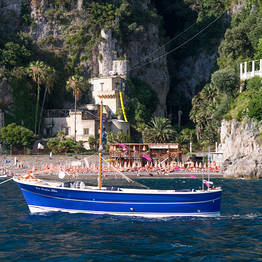 A boat tour along the coasts of Positano, Praiano, and Amafli is a must if you want to see the most spectacular side of the Amalfi Coast, with its rugged cliffs and colorful fishing villages perched on the hilltops and waterfronts. Departure ports: Sorrento, Positano, Praiano, and Amalfi. There are also mini-cruises which depart from Castellammare, Naples, and Salerno. Tours which depart from Castellammare and Sorrento also skirt the coastline of the Sorrentine Peninsula, rounding Punta Campanella where the remains of the ancient temple dedicated to Athena dating from the Magna Grecia are still visible. Mini-cruises on boats with 30-40 passengers: average ticket price of EUR 35-40 and the option to have lunch on board. Semi-private small group gozzo tours for a maximum of 12 passengers: average price of EUR 70-80 including a sandwich and beverage. Private boat rentals with a skipper during which you can set your own duration and route: average price EUR 150 for 2-3 hours.